Glass fusion is a magical technique which enables artists to create a glass design that is fused together in our kiln. We offer glass fusion classes that guide you through our own pre-designed projects, or come in anytime and we’ll get you started! 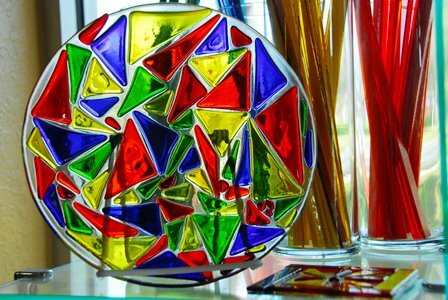 During a class you will have the opportunity to learn about the art of glass fusing and create your own unique masterpiece. You will learn how to cut and nip the glass. By layering various pieces of glass you can create bowls, plates, candle holders and wall hangings, as well as earrings and necklace pendants! The possibilities are endless. Our children’s classes begin at $22.00 for a beautiful and creative nightlight and our adult classes begin at $25.00 depending on the projects. Check out our calendar or stop by the studio for more information on the art of glass fusion. We also offer a “bottle slumping” service. Bring in your clean (labels removed) wine bottle and we can slump it for you – either flat or in a shaped mold. The price for this service is $15 each or 2 for $20. We have to warn you, though: Since this is an art, not an exact science, we cannot guarantee the results.